Until now. Browsing a few new cookbooks, I discovered a couple of different recipes for risotto. Not just any risotto, though: barley risotto. Instead of using arborio rice, these recipes called for barley, which satisfies my requirement of eating lots of delicious whole grains. Mmmmm, whole grains! So, I put an end to the flip-flopping that would often occur in the rice and grain aisle of Whole Foods, and hit the bulk bins for some barley. Tonight, we were going to have risotto. 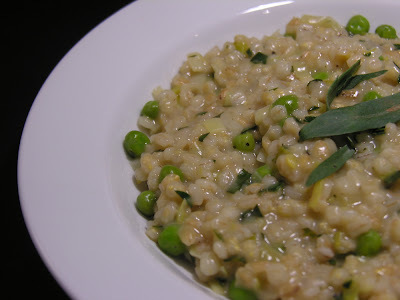 The risotto I made was inspired by a few different recipes; a couple for barley risotto, and one for regular risotto. I wanted something full of flavor and with a little vegetable to boot, and that is how Leeky Lemon Risotto was born. The risotto came out beautifully, and the barley was perfect. It has more character than arborio, but the flavor and toothsomeness of it fit well with the other flavors in the dish. Hot out of the pan, it was filling, creamy, and rich - without actually being that creamy or rich. We had it with swordfish, which was a lovely complement, but it could also be a meal in itself, especially if you add some chopped chicken or shrimp. Heat oil and butter in a medium-large saucepan. Add shallot, garlic, and leeks, and saute until softened, about 5 minutes. Season with salt and pepper. Meanwhile, heat stock in a pot and keep at a gentle simmer. Add barley to saucepan, stirring to coat with oil, and saute for another 2-3 minutes, until barley is shiny. Add white wine, stirring until almost completely absorbed. Now the fun part: start adding hot stock to the barley. Add by the ladle-ful, stirring to incorporate. When stock has almost been absorbed, add another ladle-ful. Repeat until barley is just about cooked. Barley should be tender, but not completely mushy. This process should take about 30-40 minutes. Patience. When barley is just about cooked through, add frozen peas, stirring until they are heated through. Finally, add your seasonings: lemon juice, zest, herbs, and a dash more salt and pepper. If you want a slightly richer risotto, stir in some butter, a splash of cream, or some grated parmesan cheese. Serve immediately.